Paul and I pick out our Plain 100+ finishers' rocks and promptly flop back down into our camp chairs. With a wry smile, race director Tom Ripley quips that if we lose them he'll mail out a new one for only $1,000 including free shipping. With zero hesitation, Paul nails the response: "That would be easier than running it again!" Plain is a unique event. When you don't have aid stations, course markings or much fanfare, running in the mountains simply is running in the mountains. I guess it's a "race," but it surely doesn't feel like it. Since Plain is considered a graduate-level 100, I was signed up as a "resume entrant." Before registering I had to email RDs Chris Ralph and Tom Ripley with what I'd done, and what I planned to do before Plain, and they allowed me to sign up (Tom said they let a few resume entrants in each year; most people now run the Plain 100k loop one which then allows them to sign up for the 100+ the following year). At Gorge 100k, where Paul and I also ran together, we talked extensively about Plain and having him sign up so we could run together was awesome. I didn't do any special training for it, just a lot of long 40-to-60+ mile runs in the mountains all summer, spending a lot of time on my feet. Doing a last long run two weeks before Plain I tweaked a tendon pretty bad, so my taper turned into recovery with the aim of just trying to get as close to 100% as possible. A blessing in disguise, maybe, I only ran about six miles in the two weeks leading up to it, instead walking a mile or two everyday to try and keep things loose. 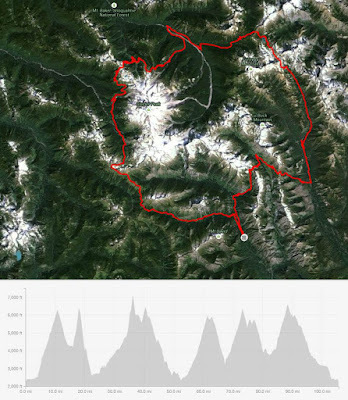 My Dad agreed to come out and crew for me and before the pre-race meeting on Friday afternoon we drove the initial FS road that you start on and I also walked a portion of the Lower Chiwawa trail, the section of loop two where many people get lost. Two things became immediately apparent: this is going to be really rocky and when people talk about the Satanic Plain Dust, it's not hyperbole. Tom's pre-race trail briefing was very beneficial for marking key water sources on our maps, pointing out where Search and Rescue personnel would be stationed as checkpoints to keep track of runners and to hear his thoughts and advice on what it takes to finish. We rented a cabin just a couple of miles from the start and went over last-minute details with my Dad and Maddy, Paul's wife. A few hours of sleep and we were at Deep Creek campground, the start, 60-mile resupply point and finish. Paul and I took things quite casual the first 25 miles or so, spending some time with Tim Gorbold, Will Thomas and George Orozco (running the 100k). Some tough technical trails on Hi Yu, but mostly nice meadows, lightly-wooded trails and rolling terrain brought us to Tom and Chris stationed at about mile 28, the last water source for 11 miles. It was barely a trickle and a frog jumped out of the one good filling spot. It was the only place on the course we treated water. So far in all of my long ultra races, my bad patches have happened early. After filling up and leaving them, Paul and I were with Tim and Selina, who was running the 100k. The course gets more exposed on Tyee Ridge which also is south facing and things started to heat up. My stomach had already been quite tight and I basically was forced to stop eating. Every time I tried to I felt worse, so from my past experiences I knew it was better to stop altogether. After finishing the ridge trail we headed down for the long, rocky and dusty descent to Cougar Creek. We both ran out of water, got super hot and were very grateful to finally reach the creek where Tim and Selina were already filling up and getting ready to go. We took our time, cooled down and drank a bottle before getting ready to move on. The next section was down and back up the Mad River canyon, a substitute for the trails still closed from the summer's fires. During the meeting Tom had described this trail as "really nice." What an artful speaker that Tom is! It was tough to find any rhythm as it was rolling, rocky, a bit brushy and hot. I'd met Plain veteran John Fors the night before at the meeting and he caught up to us and we spent most of the climb back up the river together to Maverick Saddle. We leapfrogged a bit down the descent and he was in and out of Deep Creek quite quickly, maybe 10 minutes ahead of me and Paul. We had finished loop one in 15 hours and came in as it was getting dark, just before 8pm. While we had expected to stay only 10 minutes at Deep Creek, it ended up taking 30 minutes to lance blisters, reapply lube, eat/drink, change clothes and shoes, resupply our packs and get ready for the night. This ended my eight-hour period that I'd done on approximately 200 calories total. I drank some Coke that I had waiting and instantly felt better; a couple spoonfuls of Paul's soup helped too. Maddy and Dad were great in getting all of our stuff together, including giving us hot, real food. Thanks you two! During the last few hours before Deep Creek I was a little worried that if I couldn't eat I would have to drop, but I knew Coke always worked for me in the past. I instantly was relieved that I seemed to be able to eat without issue and as soon as we walked out of Deep Creek I was pretty sure we were going to be finishing. The Lower Chiwawa ORV trail is an unrelenting 11 miles of rolling ruts, whoop-de-doos and dust. And the best part is you get to do the first 6.5 miles twice as it's the stick of the lollipop! We marched along, running any downs we could and didn't really have any navigational issues. We passed John about half of a mile in as he was hiking back toward us thinking he was off route. This was the section I walked just 30 hours earlier and I was sure we were on the right trail. After passing John we didn't see any other runners for the last 45+ miles. By the time we reached the Chikamin Tie checkpoint around mile 81, it was 2:25am and starting to get cold. We'd been taking some caffeine, but a mile later I just couldn't stay awake. Paul and I had discussed taking a nap, maybe, but at that point it became more of a necessity than an option. Paul set a timer for ten minutes and we laid down literally in the middle of the trail and closed our eyes. We were pretty cold when we got back up and started moving but our mental state improved markedly. From there on the rest of the morning pretty much centered around waiting for the sun to come up and heat things up. Everything was frosted over up on top of Chikamin and around Mad Meadow/Lake, as we'd seen temperatures swing from 80s during the day to upper 20s at night. First light hit Glacier Peak as we traversed the top of Alder Ridge and prepared for the 10-mile 4,000' descent back to the Lower Chiwawa. 90 miles in, it was quite painful to run downhill for that long. The switchbacks are long, which is nice because the grade stays moderate so you don't have to brake too much but it makes it feel never ending. After checking in with Search and Rescue at the bottom we hopped back on the Lower Chiwawa, homeward bound. I listened to music for the long downhill and a good chunk of the last six miles just to take my mind off of my body; Paul's mental strength was impressive. I think it was after our nap that I had brought up targeting a sub-30-hour finish and we were pushing as much as we could (in all honesty we were slow, but I don't think miles 100-106 are supposed to be fast). We came down the little 50-yard hill where the trail spits out onto the FS road at Deep Creek. I could hear Paul behind me, crying, Dad and Maddy were at the bottom cheering and RD Tom was standing in the middle of the road saying, "You're not finished, run to me!" There was no actual finish line, no buffet table, no music. One Search and Rescue/timekeeping truck, Tom, Chris, a few other crew people and a couple DNFed runners were all bundled up, even at 10:30am, and were the only evidence that something actually was happening out here in this corner of the Cascade's Entiat Range. We talked with Tom and Chris, discussed the trails with a runner who had gotten near-hypothermic and dropped, got our Plain 100 rocks and then went back to the cabin to clean up (two showers later my feet still are tattooed with Plain dust and grit). Thank you Paul; it never would have happened without you. Thanks Dad, Maddy and the other runners we spent time with; you all provided great boosts throughout the day and night. Congratulations to all of the other runners who started on Saturday morning: 40 went off at 5am and there should have been a record number of finishers (I think we finished tied for 7th, and 12 runners still were on course while 20 had already dropped). I hope everyone else was able to stay safe and enjoy it as well. Well done Luke! You've got to be extremely proud!! What's next? What seems like a calm, controlled, even effort. Very proud of you (& Paul). Rest up. What an amazing first 100 miler experience. This race was made just for you. I'm glad a got to share a bit of the trail with you. Nice work! After a year break in 2015 due to fire danger, the Plain 100 is back on September 17th, 2016 at http://www.plain100.com. Ready for another? Ha! Maybe; need to decide if I want to keep up the Hardrock qualifier...or if I'd just rather run an adventure 100 somewhere!